This stonefly came to electric lights at Kakamega Forest, Kenya, Oct. 2016. From Wikipedia: Stoneflies are believed to be one of the most primitive groups of Neoptera, with close relatives identified from the Carboniferous and Lower Permian geological periods, while true stoneflies are known from fossils only a bit younger. 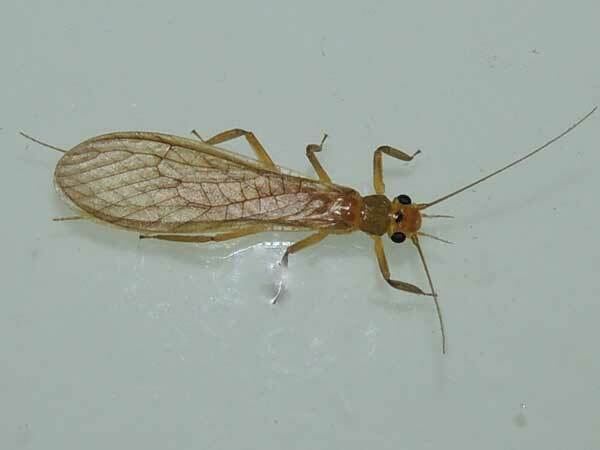 The name "Plecoptera" literally means "braided-wings", from the Ancient Greek plekein ("to braid") and pteryx ("wing"). This refers to the complex venation of their two pairs of wings, which are membranous and fold flat over their backs. Stoneflies are generally not strong fliers, and some species are entirely wingless. The female will fly over the water and drop eggs in the water. Eggs are covered in a sticky coating which allows them to adhere to rocks without being swept away by swifting moving currents. The eggs typically take two to three weeks to hatch, but some species undergo diapause, with the eggs remaining dormant throughout a dry season, and hatching only when conditions are suitable. The insects remain in the nymphal form for one to four years, depending on species, and undergo from 12 to 36 molts before emerging and becoming terrestrial as adults. Before becoming adults, nymphs will leave the water, attach to a fixed surface and molt one last time.